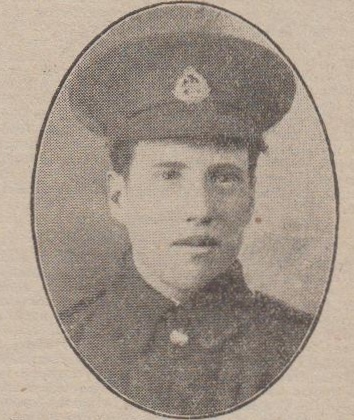 In our report of Haslingden soldier heroes, in our issue of last week, Private Walter Holden of the East Lancashire Regiment, youngest son of Mr. and Mrs. Yates Holden, 33 Parkinson Street, Haslingden was inadvertently reported killed in action, when as a matter of fact he was officially reported to be amongst the missing. He is 21 years of age and enlisted about two years ago having been in France over twelve months. He was connected with the Parish Church Schools, and was formerly a weaver at the Commercial Mill. 2) Many people will be sorry to learn that Private Walter Holden, East Lancashire Regiment, son of Mr. and Mrs. Holden, of 23 Parkinson Street, Haslingden, was killed in action in France on 15th July, 1916. He was reported missing on that date, but his parents did not learn until a few days ago that he had actually fallen at the time. Aged 22, the deceased was a weaver until he joined up a couple of years or so ago and he had been at the front about a year. He was a scholar at the Church day school, and a member of the Parish Church. His father is a stonemason. In loving memory of our dear Son, Private Walter Holden, of the East Lancastrians, who was killed somewhere in France July 15th 1916. From Father and Mother, Brother John James (serving in Egypt), Sister Elizabeth Ann, Brother in Law andNephew Tom, 33 Parkinson Street, Haslingden.